Not to mention lighting that legendary opening ceremony at the 2012 London Olympics, and the Glasgow Commonwealth Games, and the Beijing Olympics Handover Ceremony. Tim has been a regular visitor at the College since he graduated, giving workshops and masterclasses. As the International Chair in Stage Management, he’ll be working with students on direct projects over the next year. Watch this space! 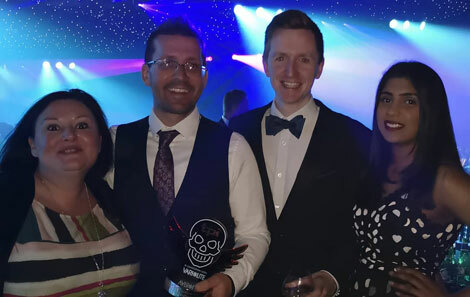 He can be seen here at the recent TPi Awards where he won the Lighting Designer of the Year Award, along with the RWCMD posse: Clare Porter, another graduate who also taught at the College, and grads Josh Kroon and Kay Givane. Also there on the night was third year student Jasmine Williams who won the position as associate lighting designer lighting on the night for the sponsor’s Robe VIP lounge at the ceremony. Tim’s many awards include Lighting Designer of the Year 2019 & 2015 Total Production International Award, as well as being shortlisted 2016 & 2017 & 2019, Royal Television Society & BAFTA Wales awards, and he’s been nominated for both an Emmy and a BAFTA. 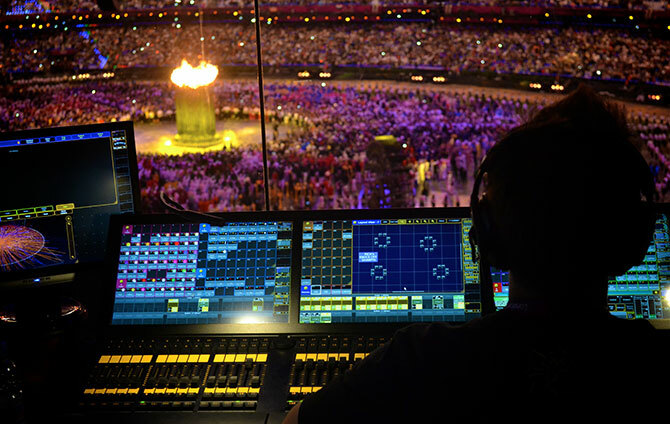 The featured photos is Tim’s image from the opening ceremony of the London Olympics.